Queen Philippines Pageant 2017 | Tonight a new queen will be crowned! 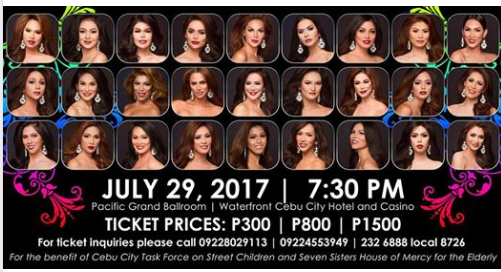 On its seventh edition, Cebu-based Queen Philippines Pageant is said to be the grandest pageant for transgender women in the Philippines. Themed around the very familiar tourism slogan “Choose Philippines”, a new set of beauties from all over the archipelago will vie for the title on July 29, 2017 (Saturday), 8PM at the Pacific Grand Ballroom of the Waterfront Cebu City Hotel. Link to the official live streaming of Queen Philippines 2017 will be provided here once available. Tune in on this site for the Queen Philippines 2017 live coverage. More links will be added here on the actual pageant.